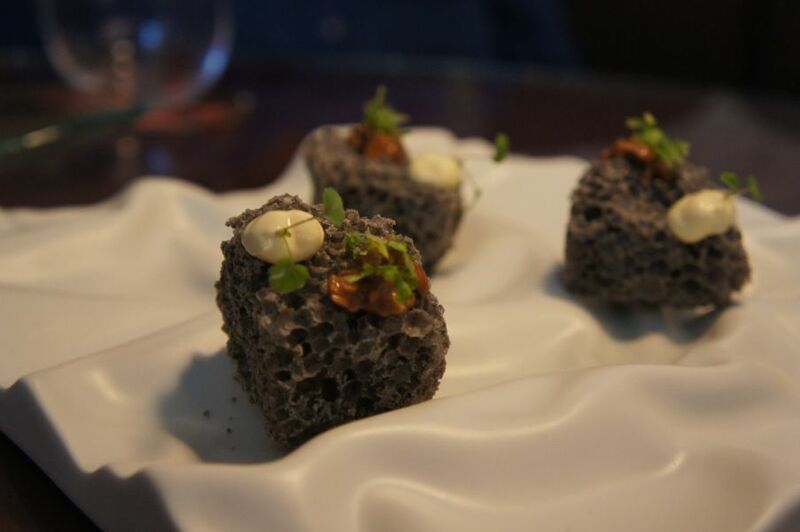 I’ve always moaned and groaned and complained and just generally been grumpy about never having made it to El Bulli – well, the more realistic version of that is – never being able to make it to El Bulli as a result of being pipped to the post by almost everyone else. 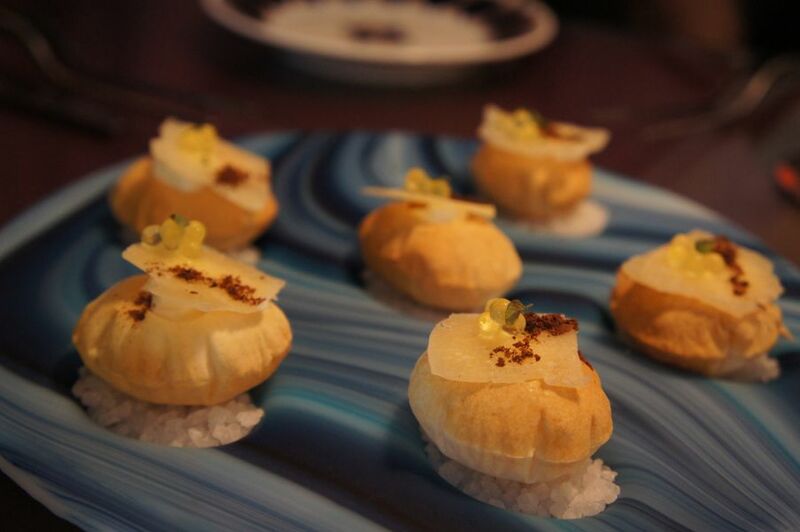 Then, just when my luck in booking restaurants favoured me, El Bulli closed down. Clearly, Edesia and Annapurna weren’t with me on this one. Around the same time, the name Tickets seemed to bounce around my ears quite a bit and I then found out that the Adria brothers had launched a tapas bar in Barcelona. 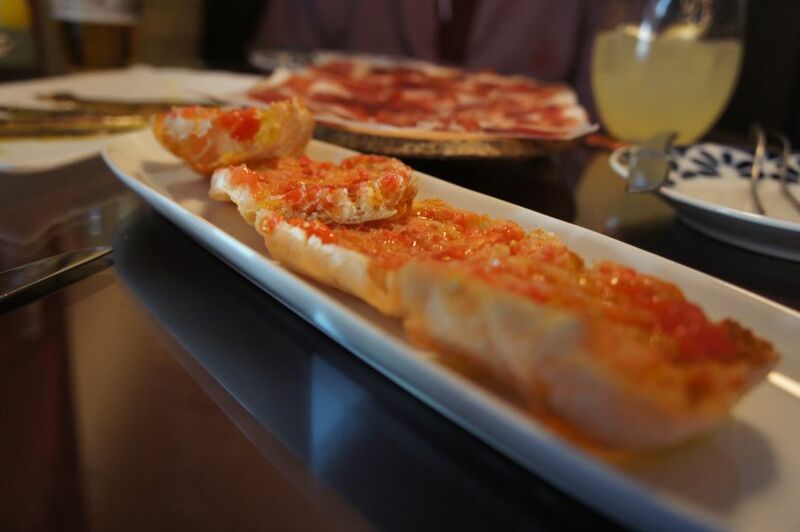 Now it doesn’t take a genius to figure out that Adria + Tapas bar = You-need-to-go-eat-there! Barcelona, Barcelona, a city of many wonders, of much mirth, merriment and magic. The city where, at a tapas bar called Tickets, you cannot get a booking, for love or money! No siree! Not a booking. I was foolish enough to think that callings 10 days in advance would be a good idea. 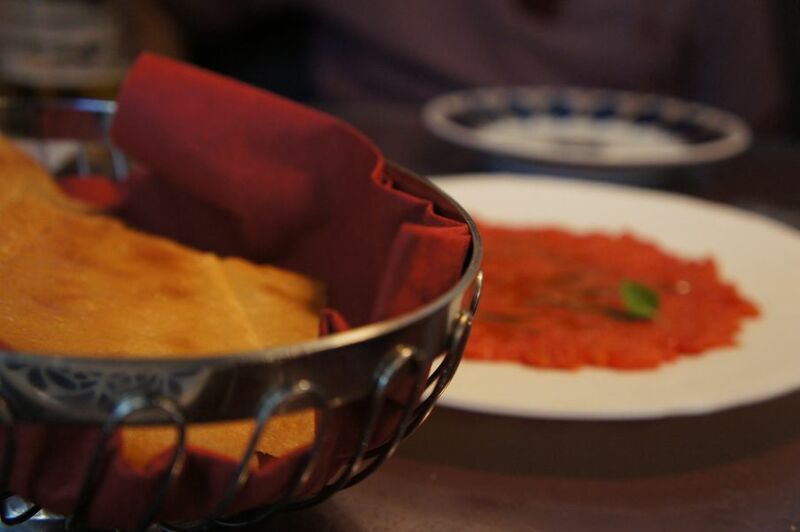 You’d be lucky to get a table even by calling 100 days in advance – this restaurant really is the hottest ticket in town! Whilst I began to feel all mopey, my twitter account rang in with a golden message from a fellow food blogger, The Skinny Bib, asking if I’d like to take their reservation at Tickets as they weren’t able to make it. I think you can guess the turn of events from there. 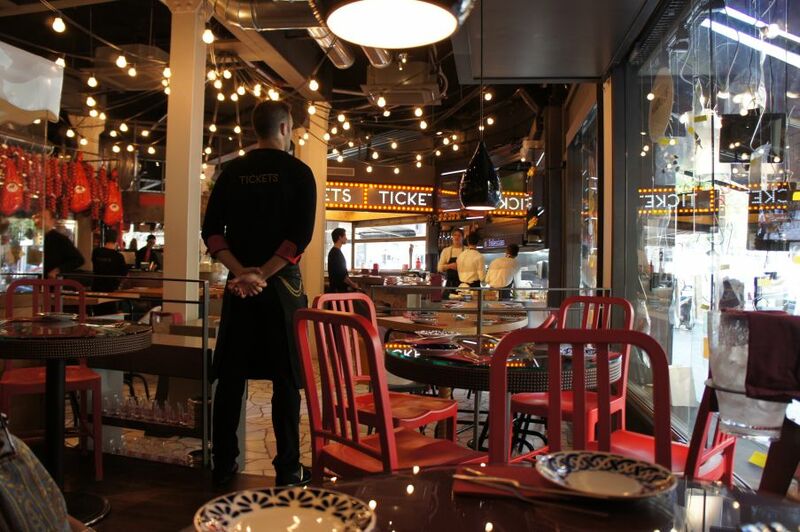 The ticket, the Ticket…everything about the place is smart, stylish and the epitome of cool. You fit right in, you gaze at the surroundings, everything in the dining room is a conversation starter from the Japanese cats that don’t stop waving, to the pincers in place of forks on your table, to the coke can sculptures, to the…I could go on. Even our waiter, Xavi, was full of energy, cool and excited and even before he finished telling us that we had the choice of ‘Surprise Menu’ or…. 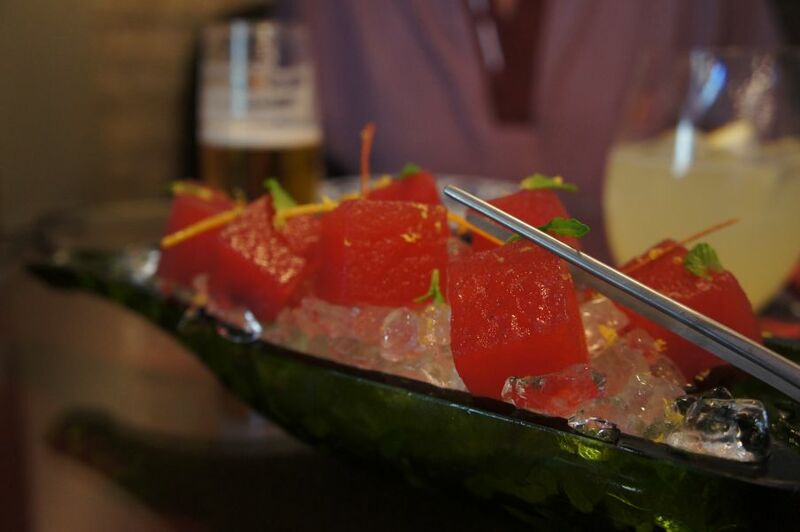 Watermelon infused with sangria: Compressed watermelon, lightly soaked in sangria with citrus zests made probably the most refreshing start to a meal I’ve had – regarding the 30c of heat we came in from! 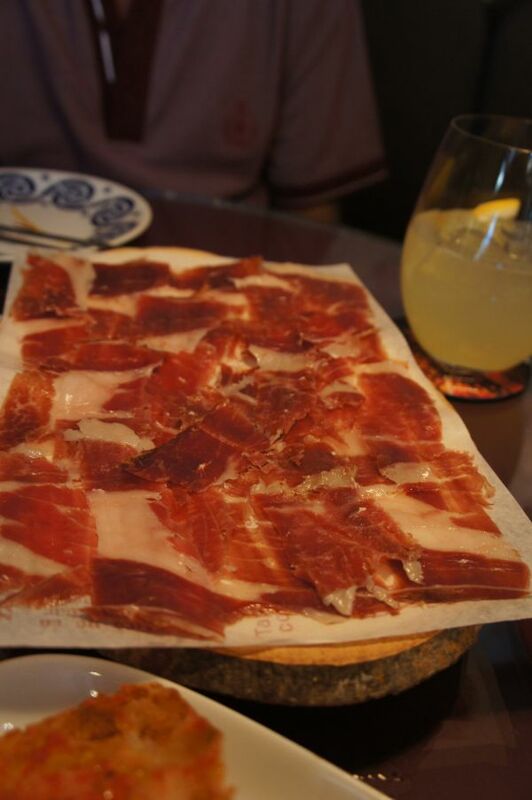 Joselito Grand Reserva Iberian Ham needs no words at all. Crystal bread with tomato spread simple, basic – nice crunch with the above munch. 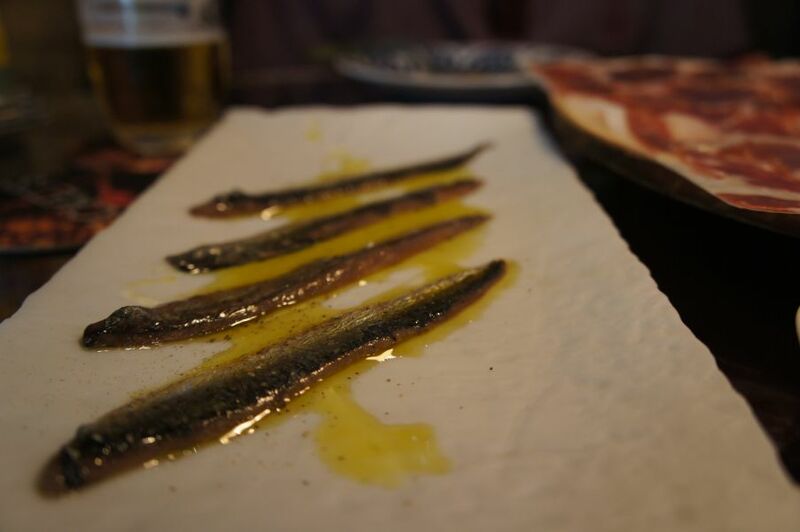 Anchovies from the Bay of Biscay little salty, but exquisite little morsels. Marinated gordal olives: One of those dishes where seeing others eat it is the only way one could actually feel the effect they have. 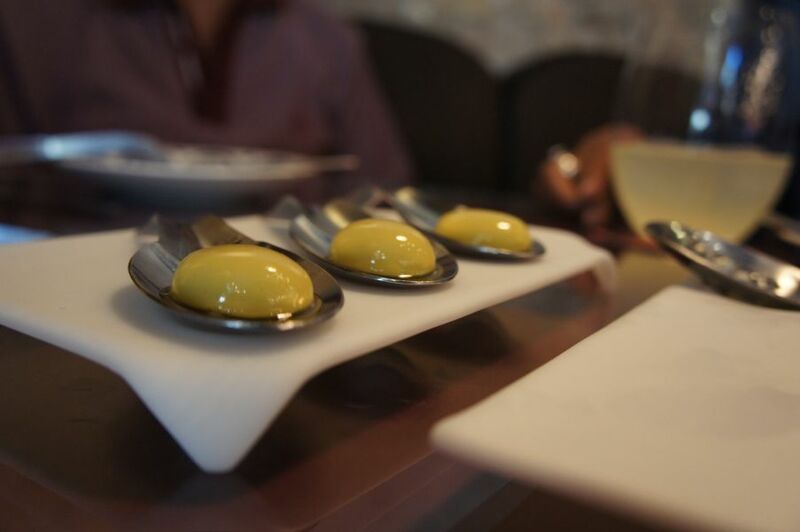 El Bulli style – they’re actually an intense olive puree,centrifuged to remove water, then transformed back into olive spheres via molecular processes. Once they enter your mouth, the dissolve instantly, glazing your tongue with the most intense olive flavour you’ve ever had and thankfully, there’s two per person. 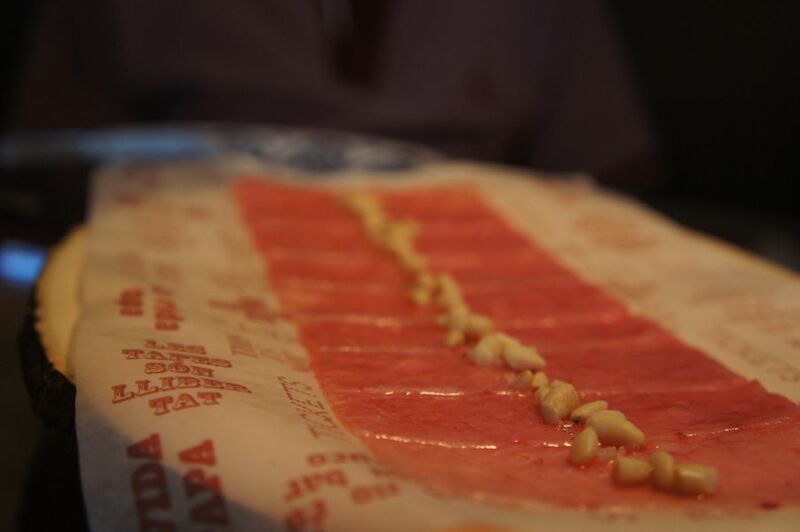 Jamon de Toro: Such delicate wafer thin slices of tuna belly, glazed with Iberico fat, a dash of pine nuts and some bread sticks…. 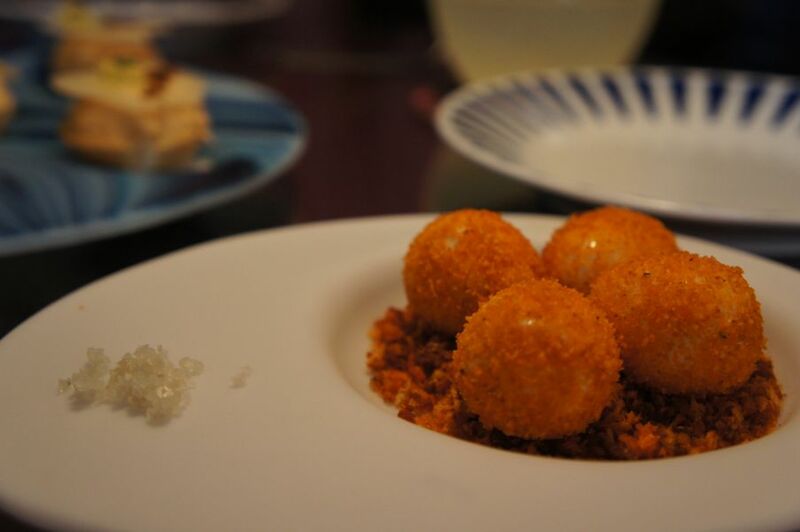 1’ 40” quail eggs’ nest with almogrote’s migas Which basically means quails eggs coated in a powder made from breadcrumbs, paprika, garlic and spices, with a bit of salt to go on top. Groovy! 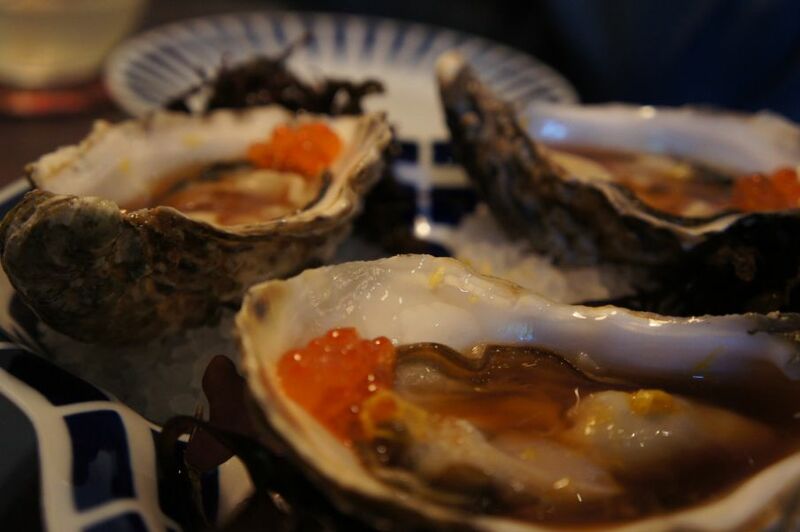 Oysters with oriental vinegar sauce and salmon roe: I think ‘Yum’ just about says it all. 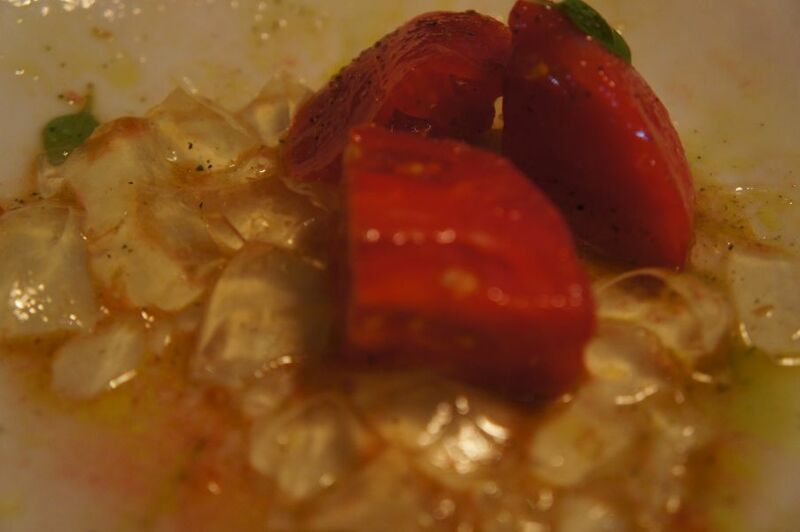 Tomato tartare, bread crisps: along with olive oil and basil seeds, this made me believe in tomatoes tasting of tomatoes again until the next course came along. Half roast bonito, ginger, soy, cucumber, salted finger seaweed: Again, all the magic flavours that need to introduction or instruction to play well – and here they do it perfectly. Strength, acidity, punch, delicacy, please can everyone trying a dish like this take instruction from Tickets – this really is the real deal – delicious, delightful, divine! 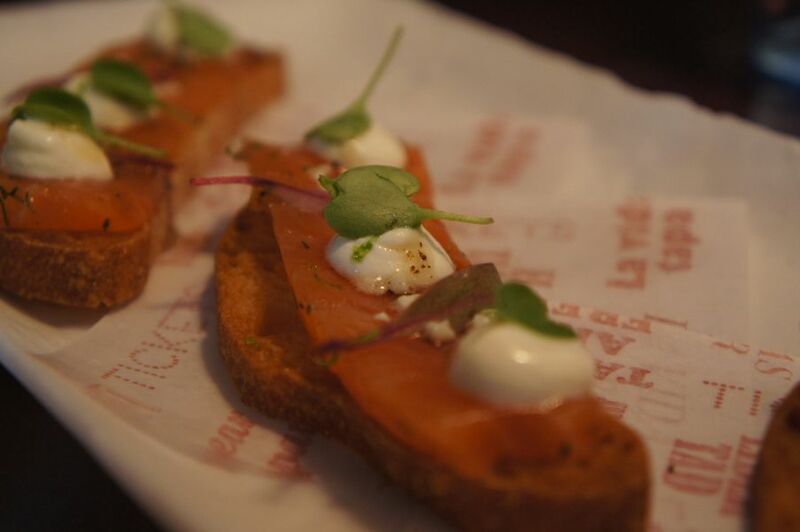 Marinated salmon with truffled honey and yoghurt: Simple – fanciful and funky with the truffled honey-yoghurt and pine nuts. The bread I found unnecessary. Pork neck with mustard in a bun: Our least favourite – could have had it anywhere in the world. 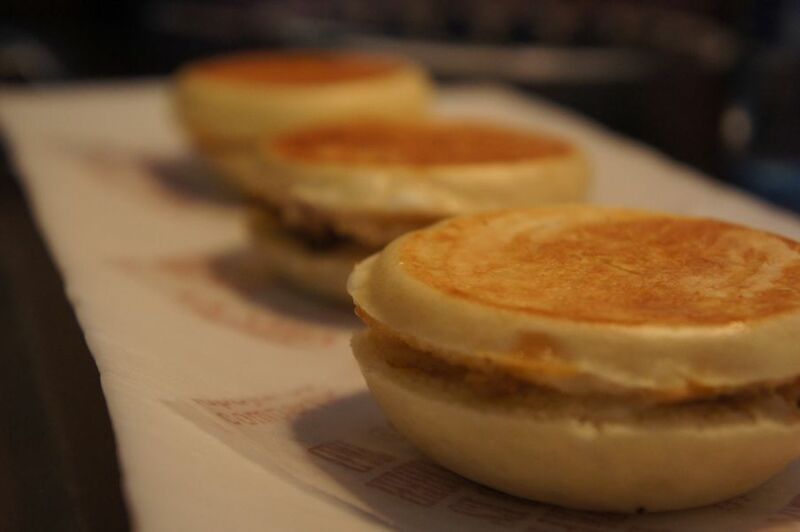 Too much bread, too much mustard, nothing special on the flavours. 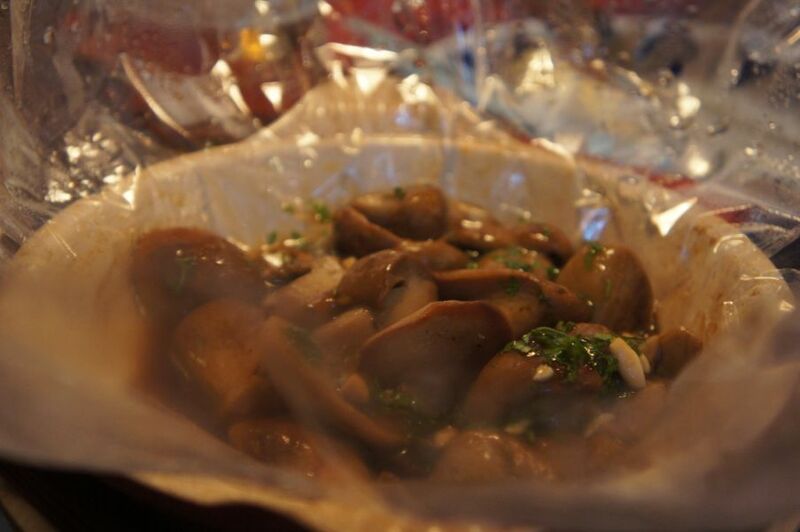 Ceps cooked with black truffle juice, honey, pine nuts: Wow! Such an abundance of ceps. In spite of the strong flavoured additions, the ceps held their own and were simply fantastic! 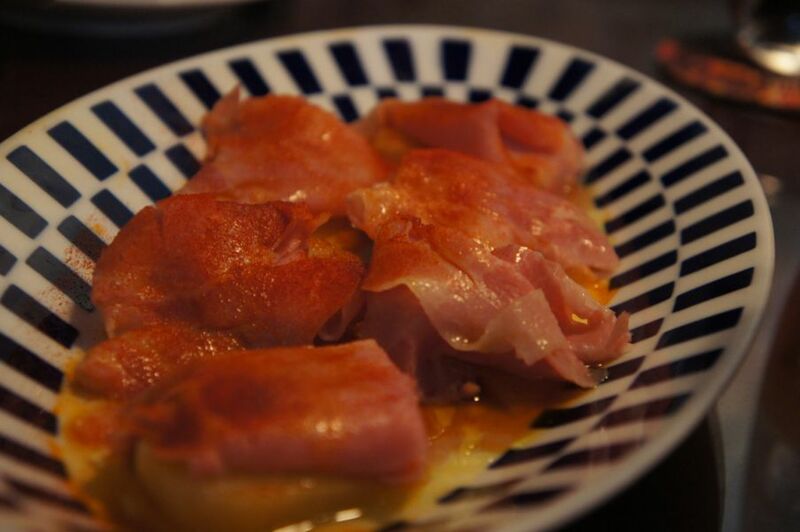 Confit potatoes in olive oil with pork rib sauce, Iberian boiled ham: made the perfect accompaniment to the ceps and remarkably light for such a heavy sounding dish. Almond tepid cake: I wish I didn’t have to share this. This is what will soon appear on menus everywhere in place of chocolate fondants. 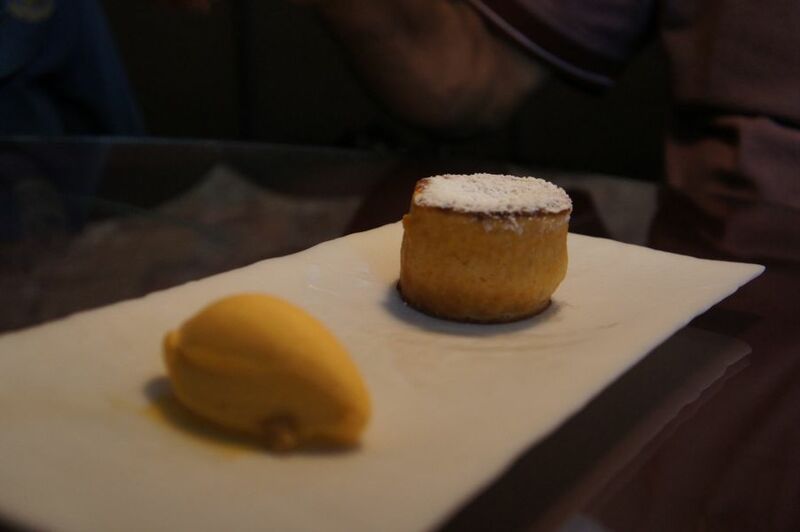 A thing of beauty indeed – the lightest almond fondant, oozing a delicate almond liquid with an amazing and zingy apricot sorbet. Next time I will only eat this dessert until I can no longer fit a morsel in my mouth. White chocolate and black sesame lava rock: You haven’t a clue as to what it’s going to taste like until it fills your mouth with a nutty chocolate flavour reminiscent of snickers but only with walnut and sesame. 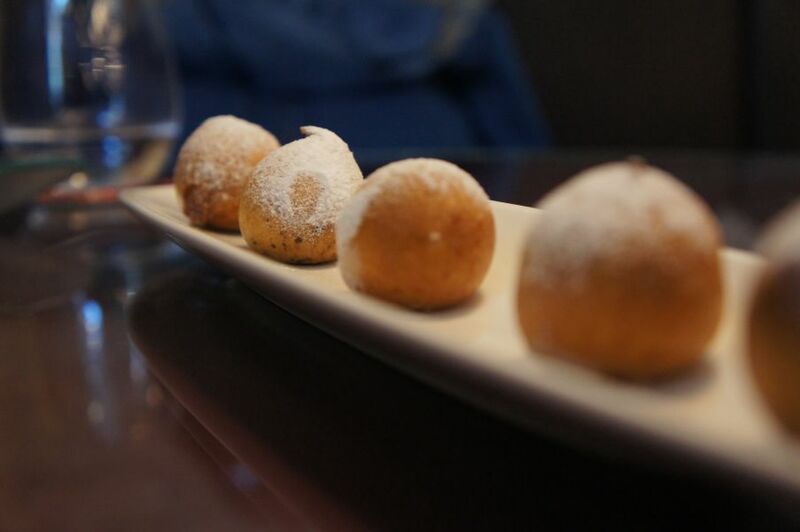 Cold-hot chocolate fritters: Or as our waiter described it, chocolate baubles. 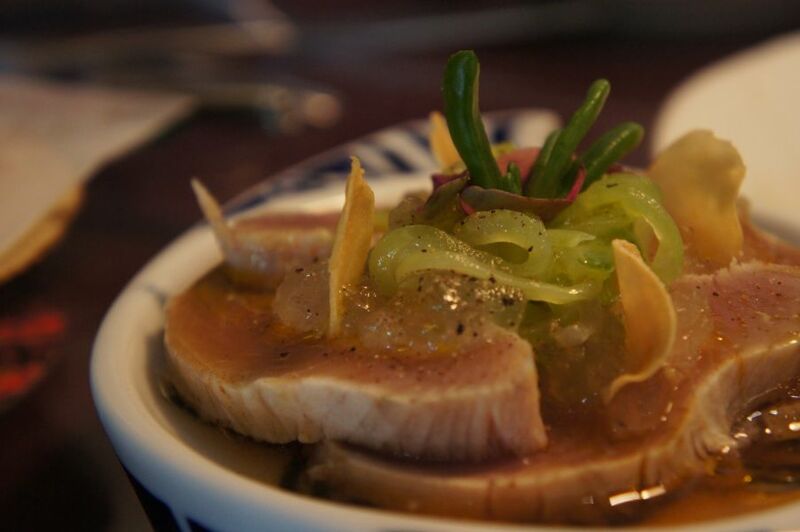 Warm on the outside, cold on the inside – it’s playful, it’s scrumptious, it makes you laugh. 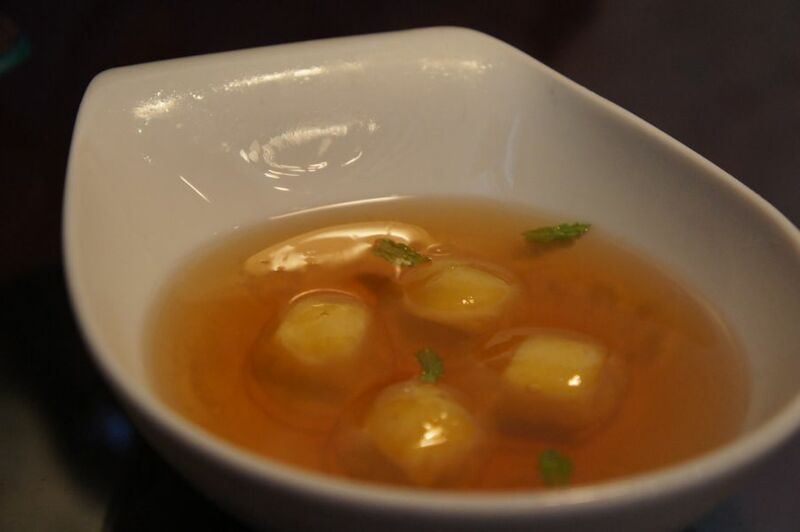 Liquid ravioli of pineapple with fir honey and citrus zest: Compressed pieces of pineapple in a honey and citrus jelly (hence the ravioli) floating in a tea soup (the lightest iced earl grey tea!). 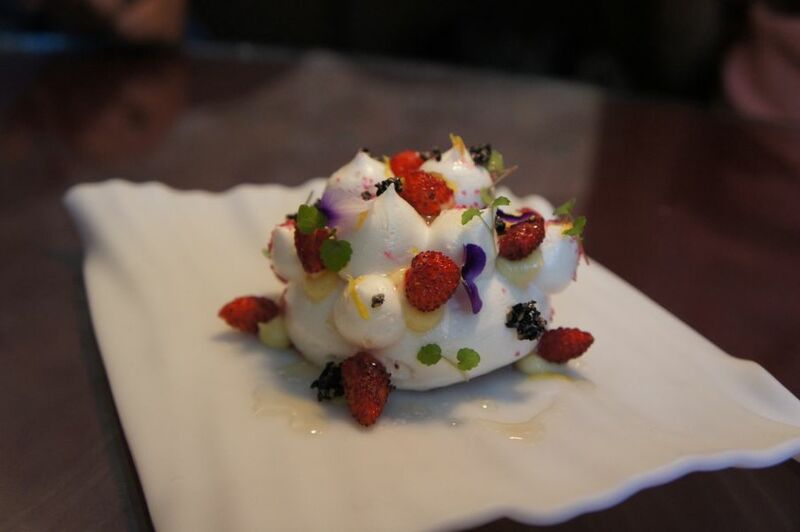 Elderflower cloud with lemon cream, wild strawberries: ticks all the boxes! 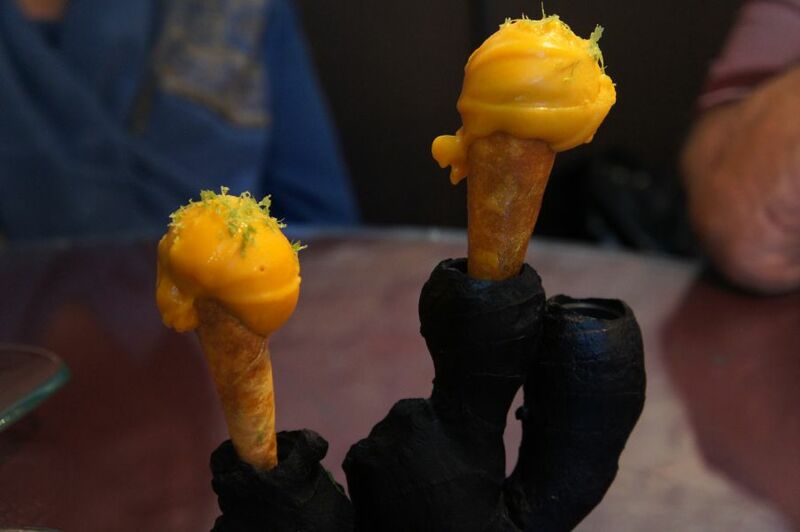 Meringue, wild strawberries, lemon, elderflower…summery, stunning…..
Mango cone with mango sorbet and lime zest: As good a mango sorbet as they come – the difference being the cone itself is made from dried mango slices!. And by now, we decided that our stomachs could no longer hold any more food, otherwise we probably would have carried on. Everything about Tickets is beautiful. It’s got an energetic buzz about it, everything’s alive and it feels good to be there, it feels good to have all this food and be able to walk, talk and think, it feels great to leave the premises feeling elated and not only having fallen in love with the food, but knowing that the food has loved you back. Muchas gracias Senors Adria!